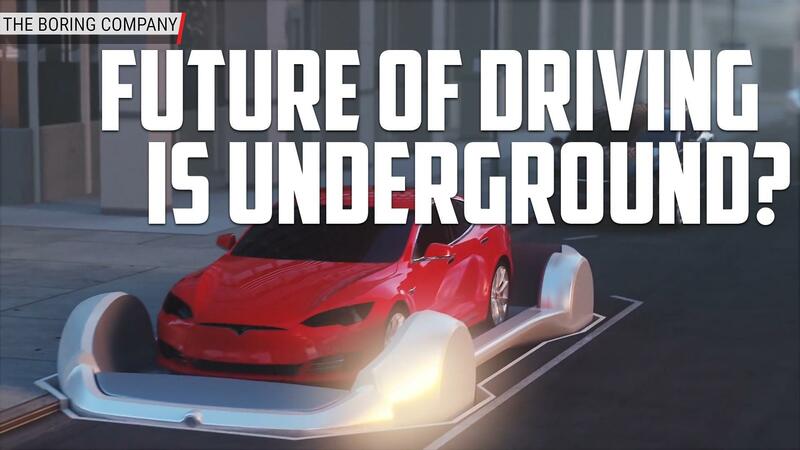 A underground tunnel connected to a garage is Elon Musk’s Boring Company’s next project | Car News, Reviews, & Pricing for New & Used Cars. Elon Musk’s Boring Company just received approval to build a tunnel entrance connected to a residential garage in Hawthorne, CA, according to a city council filing found by The Mercury News. The goal here would be to allow people to get their cars from their garage right into one of the Boring Company’s test tunnels so they can drive it near their destination once they arrive. The filing gives permission to dig a vertical shaft in a residential garage that would connect to an underground test tunnel. That tunnel would lead back to SpaceX’s headquarters. Cars could be lowered down from the garage on an elevator inside the shaft, then loaded onto an electric “skate” to be transported at high speed. Traffic reduction is one of the Boring Company’s goals. A vast network of these things would mean people would be driving far fewer miles in their cars, because it would only require a short trip once they get out of the underground tunnel. It’s smart to maintain a fair bit of skepticism on this one. The cost to install such a system in a personal home would surely be astronomical. But then again, prices for everything are astronomical around Los Angeles and San Francisco. There are clearly still a lot of hurdles for Musk and his company, because large-scale application of the the envisioned tunnel system would be a huge task. This new addition to the project is interesting, though, and would probably be happily accepted in the unbearable traffic hellscape that Southern California is.